Hanadi resides in the village of Bil’in, near Ramallah in the West Bank. It is known for it’s weekly non-violent protests, though the clashes there are far from non-violent. Her husband Rani, who has lived there all his life, was shot while at a protest when he was twenty years old (now 34) and an injury to his spine left him paralyzed from the chest down for the rest of his young life. 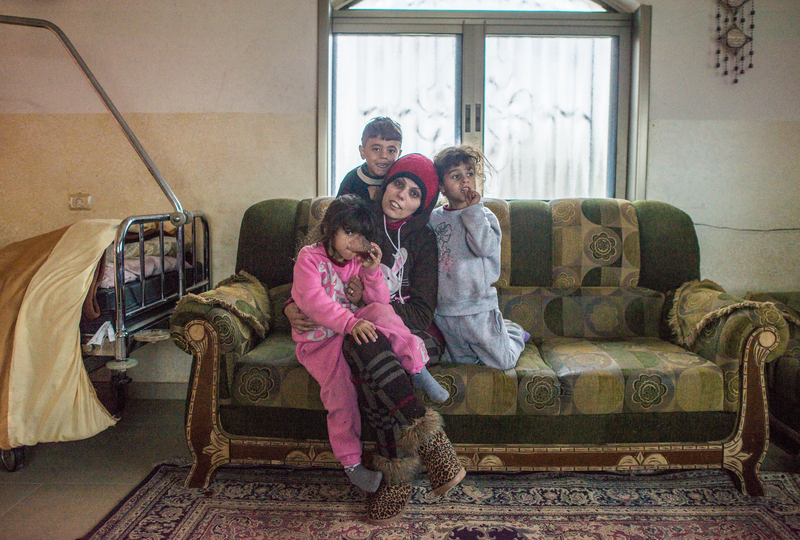 Despite this tragedy they were blessed to have had triplets, Rafif, Rames, and Abud. I met Hanadi while attending one of the weekly demonstrations in Bil’in, in February 2015. The tear gas was strong and getting to my eyes and throat, and I ended up taking shelter in her home. There was a hospital bed in the living room and I assumed an elderly family member lived there. When I saw pictures, hanging on the wall, of her husband on the day he was shot, being carried on a stretcher in the midst of a crowd, and covered in blood, she shared their story. Though this family’s experience has resulted in great tragedy, it was not with self-pity that she spoke, but rather a sense of pride that Rani had stood for what he believed in. He had lost his ability to walk, but he had not been robbed of his strong spirit in the fight for justice and in protest against the Occupation. He returns every week as usual to demonstrate, but now he is in a wheelchair. Rani is a photographer and documents the protests which he shares weekly on Facebook. 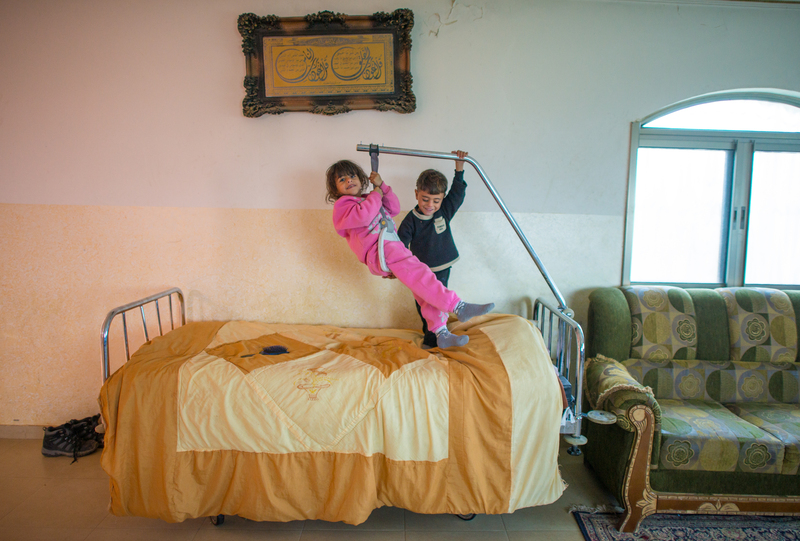 When Hanadi checked outside to see if the tear gas had died down, two of the children began to play on their father’s bed. It struck me…the irony of innocent children, playing on this hospital bed that symbolized tragedy and loss to their family…yet also served as a reminder of their father’s courage and fight for justice…something which still lives strong. 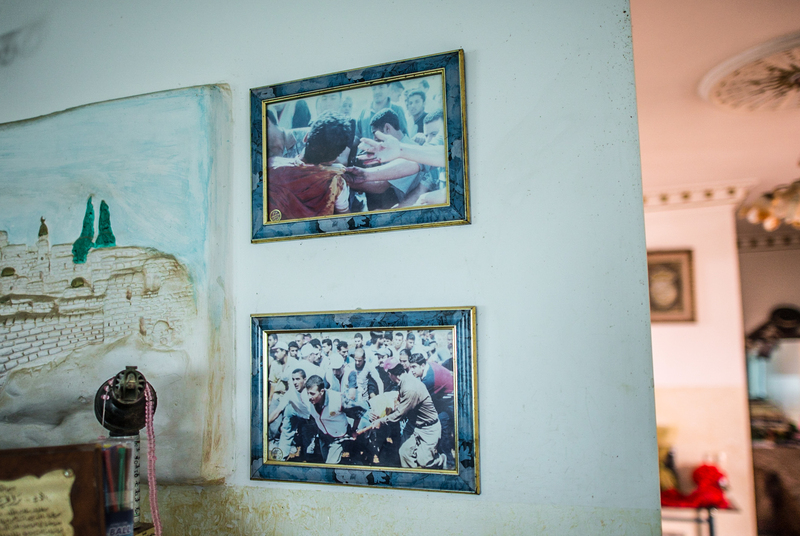 The photographs on the living room wall of Rani on the day he was shot.